An absent shamanic congregation is re-apparated in a ceremony of barefeet and soggy socks. The impulse to bring light to the darkness drives detritus to reassemble component parts in a display of object agency, while the afterglow of the discarded, the glitched and the fractured breathes on, guided by crutches counting time. Symbols manifest as cymbals and everywhere the seriousness of play is locked in the mirrored playfulness of the serious. Dylan Martorell not so much makes his artworks, as conjures them up from musical scores, where semitones and crotchets come to life as water vessels, headlights and skis. 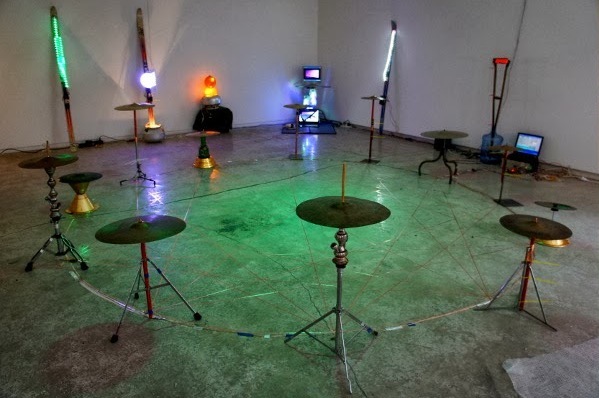 A central circle of cymbals dominates the space and reads like a venue for congress. Some cymbals are supporting by standard drum stands, some by hookahs. Cable ties hold wires that run down to the ground and to a dodecagram drawn by conductive tape across the floor. The points of this mathematical star pattern run from each cymbal in a criss-crossing cartesian playing field. Stepping on the tape in socks, or better yet in barefeet, completes an electrical circuit and activate the cymbals to your touch. This is audience activated art at its most explicit, with the participation of the haptic triggering the audio and marrying in multi-sensorial polygamy with the visual. A ceremonial vibe washes over the whole affair, matched by a lush green light that further defines the space in the round. Bearing witness to the central activities of the inner sanctum are a set of light-lamps of bodily scale. Singular skis with cheap LEDs read like broken bodies with inner spiritual glow. Shine on you crazy diamonds, with your fractured souls and your intense inner feelings. Somehow reaching upwardly from within the cracks of the most pathetic of disabled functional items – lenses, packing materials and protective devices – a leaking life force eeks its way to the surface looking for connection. There’s two sets of drawings on either side of the room. 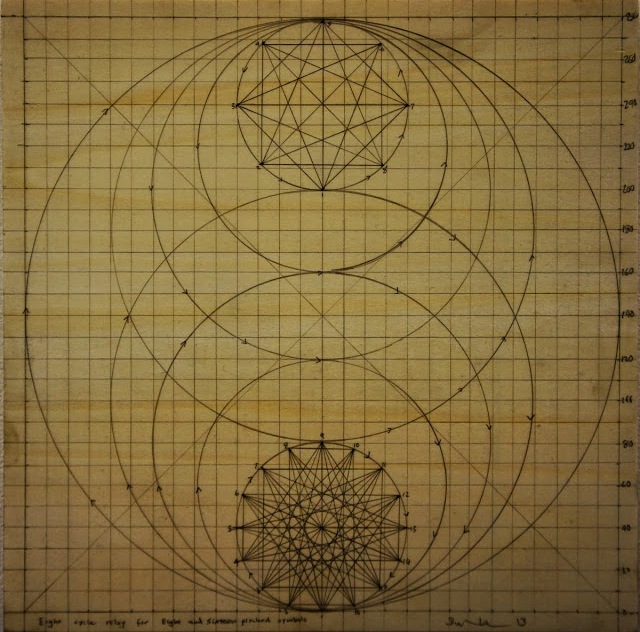 One set – a mathematical modelling of musical scores as diagrammatic symmetries; the other – an abstracted organic meandering of botanical forms and patterns. The latter is loose and free, a reflection of the underlying energies that throb and crackle underneath the material surface of the sculptures in the installation. The former is the guided hand of the artist’s urge to composition and organisational control. I can feel William Blake and Isaac Newton hovering in the wings, whipping off their boots in preparation for a cymbolic duet inside the circle, conjured by the agency of the objects in seance with phantasmagoria. An overall sense with the show is the compulsive drive to make, to compose and to find the inner life inside the most lifeless of things. There’s something compelling, even sweet, about this obviously urgent desire to articulate something, to free a force from within. Instruments must be built, time will not wait. Finessing the details is not important because the potency of the energy simply must be extracted. For twofold purpose too – to set it free for the fulfilment of its birthing destiny into the universe, but also to bring it to the world of play and for the purpose of a simple shower of joy for the curiously minded. Tags: Dylan Martorell, Utopian Slumps. Bookmark the permalink.